omg…orange shade…u do know!! so cute! those stripes are great especially against that non baby blue. 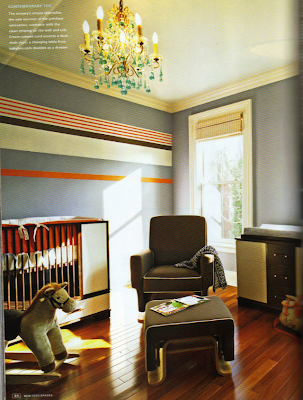 Not into the chandelier at all for a baby boy’s room. I don’t care if it’s unexpected or whatever, it looks girlie or too grown-up. Otherwise very cool. By the way, I love your blog! I love this room! Definitely has the feel for what I’d like a childrens room to be like one day! Yikes re the chandelier! My boys would have thrown basketballs at it to knock the ugly thing down!! This is awesome! The greys and reds actually remind me of my son’s room. I feel like it’s so plain, but I definitely don’t want frilly for a little boy. Looking at this post and the one below, you should go to my friend’s baby site itzyritzy.com. I bought this shopping cart cover for Ben and everytime I see the material I think of you (http://www.itzyritzy.com/product.php?id=90). I love the slate grey/orange combo for a boy's room. Serena & Lily do some amazing bedding in those colors and I love how not-too-precious it is. …Is it weird that I stalk baby catalogues given that I don't have any kids?? Well, I can see this one causes some difference of opinion! I know the chandy is different, and I would probably take it down once the boy reached the age of 5 and replace it with a cool drum shade fixture, but I love it! Oh an orange shade! I agree with Barb, you totally know!! One of the best nurserys I’ve ever seen!